CustomerGauge is very happy to share that this week we have CCXP Ian Golding as our blog guest. Ian advises leading companies on customer experience strategies, as well as measurement, improvement and employee advocacy techniques. He has worked across various industries including retail, financial services and telecoms, accumulating a robust knowledge on best customer experience practices. We caught up with Ian to discuss a popular topic in the CX world—customer feedback. While it is great to see that more and more companies launch customer feedback programs, many are still falling into various pitfalls. What are the most common customer feedback mistakes you have come across? What experience? You just arrived at the place, still waiting to be served and form an opinion about your experience. As Ian Golding points out, too many companies do not realize that customer feedback is an additional touchpoint on the overall customer journey. Asking your customers about the likelihood to recommend you at the beginning of their journey with your brand will likely give you low response rates. Alternatively, in order to make your “pop-up” disappear and access the free internet you provide, customers will most likely give any score they first see. Therefore, you might end up having an unreliable data and insights to act upon. Implementing a Net Promoter System requires partnering with specialists, who understand how to obtain the best results for your company. Here’s another example on how not to ask for customer feedback. In his blog, Ian Golding often shares his personal interactions with brands and the various ways they fail to satisfy customers. In the example below, Ian shares his experience of trying to complete a customer survey for Sky TV. Sky, like any other organization around the world, relies on the feedback of its customers to know what works and what does not work in the customer journey. In this example, however, the company has failed to show it listens to its customers, instead focusing on statistical significance. Receiving a message like this one would be particularly disappointing for customers, eager to share their insights with a brand and help it improve the services it offers. Follow up with your customers after a survey and explain them how their insights are going to be used to make the customer experience better. This will assure them that they did not just fill another market research survey, that their opinion is truly valued and acted upon. This is especially important for your disgruntled customers, the ones that tell you what is not great about your product and service. Therefore, companies should make sure they have a team assigned to deal with responding to customers, assuring them their feedback is not taken for granted and is acted upon. We call this “firefighting”. To make that job easier for your team, use an NPS system that can trigger alerts automatically by email, in external CRM or even on mobile devices with a dedicated app. NPS is a company project. Carrying out a survey and organizing the metrics can be the job of one person, but using those findings for customer experience improvements has to be a company-wide focus. Hence, an effective customer feedback program requires cross-silo accountability and top-management buy-in. We preach that the best way to get the whole company behind NPS, is engaging more people in the project. Companies can do this by creating NPS champions in each team. Make a cross-functional team (a great opportunity to recognize junior team members) and meet regularly (ideally every 2 weeks) to report what has been learnt. Remember your goal is to make the company customer-focused! Net Promoter only works if both managers and staff buy-in to it. You need to direct issues to managers that are responsible to change things. And they can best do that by giving comments to front-line workers and empowering them to fix customer issues. CustomerGauge would like to give special thanks to Ian Golding, one of our 20 CX Influencers to Follow in 2017, for joining us. 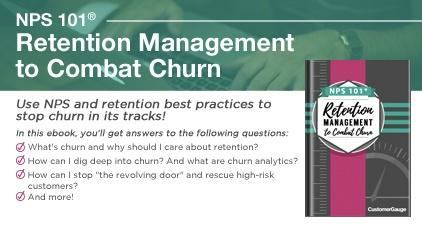 If our 3 customer feedback & NPS pitfalls have not been enough for you, make sure you download our eBook below, containing best practices on retention.